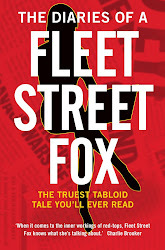 fleet street fox: All hail Naomi. THERE are many awful things in the world that we just can't seem to get rid of. Famine. Violence. Oppression. War. 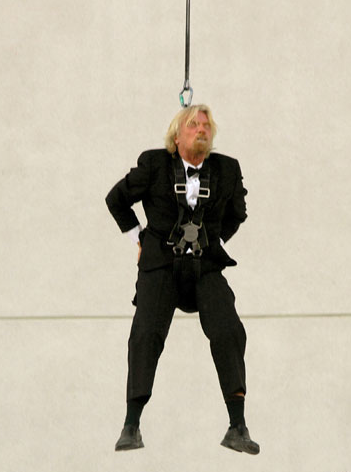 Richard Branson. Perhaps we're just too used to it, too beaten down and oppressed by our own dreadful failure to make the world the beautiful place it could be. We are stuck in the throes of a once-in-a-century global recession which a venture capitalist reckons is down to the fact people aren't getting sacked more often. A war in Afghanistan that's cost us £3 for every person on the planet has been one massive opium-growing project. And the Queen's lawyer has been misleading Parliament and authorising spying. It's enough to make you weep. And we, the people, are too hide-bound and downtrodden to rise up and do anything about it. But never fear! Naomi Campbell is here! Yes, you read that right. After masquerading for nearly three decades as a grumpy supermodel Naomi has metamorphosed into a new Messiah who is going to save us all from ourselves. Naomi unveiled her new religion on her 42nd birthday during a trip to the Middle East. After a private tour of Bethlehem - I swear I'm not making this up - she emerged from her hotel in a shimmering white dress, sparking rumours she was a born-again virgin going to get married to her billionaire Russian boyfriend, even though he's already married to someone else. Speaking to TV reporters at the mount, Naomi announced: "I’m happy to be here. Weapons and war, greed and oil … I hope it all stops. I care about health, about good vibrations, not destruction." As the Beach Boys softly wept, Naomi lit candles in the Church of the Nativity on the spot where Jesus is said to have been born and visited the Western Wall in the Old City of Jerusalem, one of the holiest places in Judaism. Naomi was attended by a number of disciples paid bodyguards, but for security reasons had to forgo riding on a donkey. Instead she opted for a cavalcade of blacked-out limousines. Naomi, who like Jesus was born in humble circumstances except it was in Streatham and worked as a carpenter doesn't get out of bed for less than £10,000 a day, ate a simple birthday meal of Palestinian lamb and rice which she shared among a gathered throng of 5,000 some friends. She had amazing hair throughout. That was yesterday. She's not been heard from since, which personally I think is a shame because I was looking forward to her hearing her talk about the meek. Perhaps she's spending three days in a cave before ascending the steps to her private jet? We can but pray. I'm sure her sheets will fetch a pretty penny on eBay. Reports of her jumping on waterskis over a shark in the nearby Mediterranean are, I am sure, wide of the mark. Many people will mock Naomi for this trip but I think that's unfair. Frankly we're lucky there is someone selfless enough to care and try to take our sins upon herself, just as willingly as she accepts what later turn out to be blood diamonds from vicious dictators who deliver them to her bedroom in the wee hours. At a time when we lack leadership and faith, it cannot but be a good thing that someone with a long experience of an industry in which people starve themselves for financial gain can help millions around the world suffering famine and poverty. And having been publicly accused 10 times, at the last count, of assault against her employees, friends and on one occasion police officers, and attending court-appointed anger management classes, I'm sure there's nothing she doesn't know about violence, oppression and war as well. "But what about Branson?" I hear you cry. "Is there anything Naomi can do about him?" Well as someone who was banned for life from British Airways planes after a dispute about lost baggage I should think the beardy billionaire's annihilation is merely a matter time. "I SAID PROPHET, NOT PROFITS!"